(CNN) -- He's won six medals in the Winter Olympics, including a gold in 2008, and a bronze just a few months ago in Sochi. 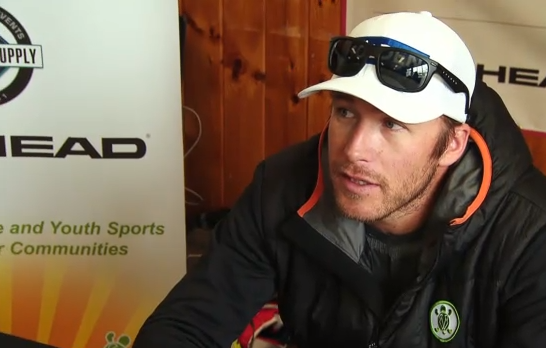 Bode Miller's methods, however, have never been orthodox. "I never really worked very goal-oriented," he admits. "I think I've had some great results and I've had a long career, so, I mean, I'm happy about that. But I didn't really ever have goals, the way that most people did." Miller has always intrigued media and fans alike. An unconventional upbringing in a New Hampshire log cabin with no electricity or running water gave way to a skiing career in which, for Miller, his natural talent and love of the sport always won out over, well, winning. Indeed, his goal, as stated in his book "Bode: Go fast, Be Good, Have Fun" was to ski "as fast as the natural universe would allow." Back home after an emotional Olympics in Sochi, where Miller cried during a live interview with NBC's Christin Cooper when asked about the recent death of his brother, Miller is focusing on another project: his Turtle Ridge Foundation. Miller began the foundation after close friend Cameron Shaw-Doran suffered a traumatic injury that left him paralyzed from the chest down. "I was trying to help him get re-involved in sports. He was a great athlete before his injury and was really having a hard time sort of adapting, which is a really tough process when you're injured like that," says Miller. "Just to watch him go through that I saw how hard it was and how little support there was for him." The experience motivated Miller to find ways to help get disabled and injured athletes more involved in sports. "We provide the sporting equipment for them and the environment that allows them to participate in whatever sport that is," Miller explains. Shaw-Doran serves as director of equipment development for Turtle Ridge, and Miller has called on friends and associates from across the sporting world to create and adapt equipment to help adaptive skiers and adaptive athletes in other sports. A major annual event for Turtle Ridge is Bodefest, an all-day ski and barbecue extravaganza on Miller's home turf of Cannon Mountain, New Hampshire, complete with autographs, an auction and a chance for children to race their idol. Watching Miller hurtle down the mountain, swarmed by a speeding army of tiny "Bodephiles," it's a wonder and a testament to his skills that the whole thing doesn't end in a giant human snowball. "All the kids want to try and get on the lift with me for at least one run and there's 400 kids or so. It turns into a bit of pandemonium on the way down," Miller says. Not only is Bodefest a fundraiser, but it's also an opportunity for adaptive athletes to try some of the new equipment on the late-season snow. "The program's really just changed my life," says adaptive skier Owen Anketell, who has a condition that affects the muscles in his lower legs. "I never thought that I'd be able to ski even though I'm in a wheelchair -- or bike -- but this program's really changed my opinion on adaptive sports." "The key is empowering," says Miller. "When we build some of our ski equipment and you give it to a kid who never had the chance to go up and experience what it is to ski down a giant mountain and you watch how life-changing that can be for them, I think it's really -- it's pretty incredible." The sentiment seems to fit with Miller's general philosophy of focusing on how the sport makes you feel, rather than the end game, a feeling he believes everyone is entitled to, regardless of ability. It may not be competition, but it is a goal he can take into retirement -- and still win.